Tally Ho! New Woggles Album Out Friday, August 11 !!!! The latest slew of party pleasers numbers 13 tracks, and was recorded this past January at David Barbe’s Transduction Studio in Athens GA. Produced by Jim Diamond, both Dave and Drew Vandenberg engineered. That same month it was mixed and mastered at Rodney Mills Masterhouse. It’s the 3rd studio full length for the band to come out on Little Steven’s Wicked Cool Records. Artwork is from Jim Stacy and features the band caricatured in a Jack Davis style. Scott Sugiuchi did the layout. If you’re in town hope to see you at one of these gigs! 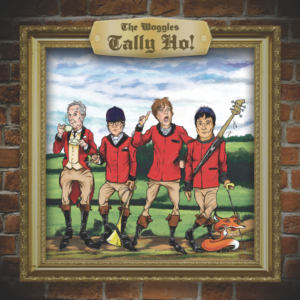 We all knew it was just a matter of time, but finally the Woggles have SOULED OUT!! The 10″ features 6 new sizzlers from The Woggles and finds the band showing off some of their Soul and R&B roots. Included are 5 cover songs and one original tune. Recorded at Dave Barbe’s Chase Park Transduction Studio in Athens, GA in 2014, tracks, include “Karate Monkey” and “Somebody’s Been Sleeping,” plus versions of “Big Bird,” “Treat Her Like A Lady,” and others. Release comes with download card and is $10 postage paid. To order follow instructions on thewoggles.bandcamp.com/releases or email us at info@thewoggles.com. Woggles Xmas Single Now In Stock!!! We finally got our new Xmas 7″ in stock! The A-side is the Woggles original tune “Santa’s Coming (Ho, Ho, Ho)” b/w a version of Clarence Carter’s “Back Door Santa.” It comes in either red or green vinyl and the sleeve is die cut in three places, courtesy of a layout by Buffi Aguero. The backside of the sleeve features artwork by Sam Leyja. The 7″s are $7 postage paid. That means the postage is included in the $7 price. Tell us whether you want red or green (or both!) and to order follow instructions on our merch page or email us at info@thewoggles.com.